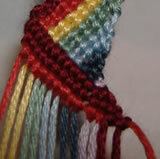 A few days ago, Jordan in Ontario, Canada asked us how to make this advanced zig zag friendship bracelet. Well, Jordan, here you go! Please note that this is also the order you'll put them in when you get set up. Please cut just one of each color, as you'll be folding them in half when we get started. You'll want something sturdy to be your anchor. I use a shoebox with heavy books inside, that way I can cut little niches into the box for the different strings (so they don't get tangled). Please note that you will only ever do a forward or backward knot over ONE string, not over groups of strings. Also, please remember that a forward knot is actually TWO knots, and a backwards knot is actually TWO knots, not just one. Doing just one knot will cause curling. 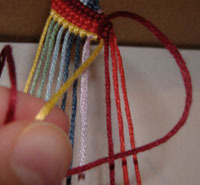 First off, fold each of the strings in half individually, and then tie a knot in the middle (Fig.1). The ends of the strings won't be flush. See Fig.2. Special Note: The advanced zig zag friendship bracelet is kind of complicated at first, but later it will be much easier. Basically, starting with the 4th string from the left, you're going to make an ascending number of backward knots with every other string, until you use your right-most #4 string. You might want to write down what each of the numbers represents to you, if it's different from what I'm using. If it's the same, you still might want to print the diagram above, to be safe. 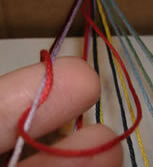 Take the left #2 (red) string and make a backward knot over the left #7 (dk. red) string (see Fig.3). 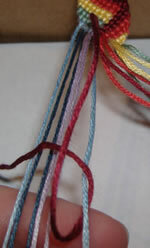 Then, take the right #2 (red) string and make two backward knots, over each of the #7 (dk. red) strings. 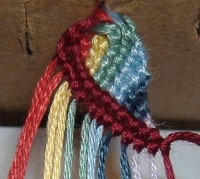 Next step in your advanced zig zag friendship bracelet - make three backward knots with the left #3 (yellow) string, over the left #6 (dk blue) and both #7's (dk. red). Again, all you're doing is just using every other string, and making backward knots - one more than you did with the last one. So, next you'll make four backward knots with your right #3 (yellow), then five with your left #4 (green), then six with your right #4 (grn). Now that you've worked through your #4 (green) strings, the next step in your advanced zig zag friendship bracelet is to start decreasing your number of backward knots. 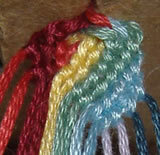 For this step, you're going to be using the right-most string, whatever color/number it is. So, take your right-most string (a #5 -- lt. blue) and make five backward knots. 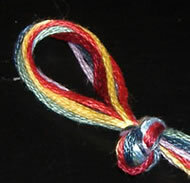 Then, take your right-most string again (also #5-- lt. blue) and make four backward knots. and finally make only one backward knot with the rightmost string (#7 lt. prple) onto the string to the left (the other #7). Alright, the complicated part is over and we're ready for forward knots! This time, you'll be working with the left-most string. So, take your left #1 (dk. red) string and make thirteen forward knots. Go all the way across to the rightmost end. 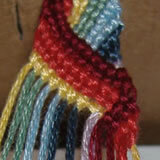 We're starting to get into the zig-zag of the advanced zig zag friendship bracelet (finally). Then, take the next left-most string and make twelve forward knots, up to the point where you hit the other #1 (dk prple) string (see Fig.5). Don't knot onto that last string. Take that other #1 (dk prple) string (NOT your active one), and make a backward knot over the string you've been using. Make forward knots with the left-most string until it hits the #1 string, then use the #1 string (and all strings that are to the right of it) to make consecutive backward knots over your active string (see Fig.6). Take your left-most string (#2 red) and make twelve forward knots, followed by two backward knots with your two #1 strings. Then take the next left-most string (also #2) and make eleven forward knots, followed by three backward knots (two of them will be with your #1 strings and one of them will be with your other #2 string). Continue taking your left-most string and making forward knots until you hit your #1 string, then making backward knots with #1 and all the strings to the right of it (over your active string). Do this until your active string is #1 again, and then repeat Steps 6-9 until you only have about two inches of thread left. Separate your threads into three chunks, braid them for an inch or two and knot it off.